What Are the Olympic Equestrian Sports? What are the Olympic Equestrian sports? The Olympic Equestrian sports are dressage, three-day eventing and show jumping. Horse sports such as chariot and riding races were part of the early Olympic games. Riding was first included in the 1900 Olympics and reappeared in 1912. Originally in the modern Olympics, only commissioned officers were allowed to compete. Beginning in 1952 rules were changed to allow civilians and women. Olympic equestrian events are one of a very few Olympic sports where women compete equally with men. All Olympic equestrian disciplines are governed by the rules of the Fédération Equestre Internationale (FEI). Dressage is the systematic training of a horse to carry a rider with ease and grace. Dressage competitions demonstrate the level of training a horse and rider team have attained. During the test, you will see the horse ridden at different paces and different speeds within those paces. The horses will be asked to fluidly move in straight lines and circles. The horses will also be asked to move smoothly and obediently sideways, diagonally and in place. You will see horses in 'collection' where the horse is moving with a higher elevation of back and legs, and 'extension' where the horse is reaching further with its legs while still carrying its neck and back in an elevated frame. Olympic level dressage competition highlights the most advanced and refined riding skills. It is often compared to ballet on horseback. The first Olympic competition was in 1912 although the sport is centuries old. Olympic dressage is scored by 5 FEI judges; each sits in a different position around the arena. Scores are based on the accuracy and brilliance of each required movement of the assigned test and rated on a scale of 0 to 10. Horses and riders at the Olympics compete at the highest level of dressage recognized by the FEI; Grand Prix. Kur or freestyle is a dressage test choreographed to music. The score is based on the accuracy of the movements and artistic impression. The highest score wins. Show jumping tests the ability of horse and rider to jump over a series of obstacles inside a riding ring. You will see horses and riders jumping over a preset course of 10 to 16 jumps that are up to 6ft 6in (2m)high or wide. Courses are designed with many tricky turns and colorful obstacles challenging both the mental and physical agility of horse and rider. The horse/rider teams must finish within a set time and penalties are given for knocking down rails and other faults. Scores are based on the number of jumps knocked down, falls, touches, refusals to jump and time penalties. The rider with the fewest penalties wins. Ties are broken by jump-offs with penalties and fastest times used to break the tie. Riders inspect the course before riding to plan the best strategy for jumping these very challenging courses cleanly and quickly. Eventing is a test of the skill, versatility, courage, and endurance of horse and rider. Three-day eventing is held over three days and consists of three disciplines: cross country jumping, dressage and stadium jumping. The cross-country phase takes place over a course of natural and man-made objects. There can be up to 40 obstacles that horses must jump or go through over the course that is up to four miles long. Scores are based on refusals, coming in under or over a set time and falls of the rider. 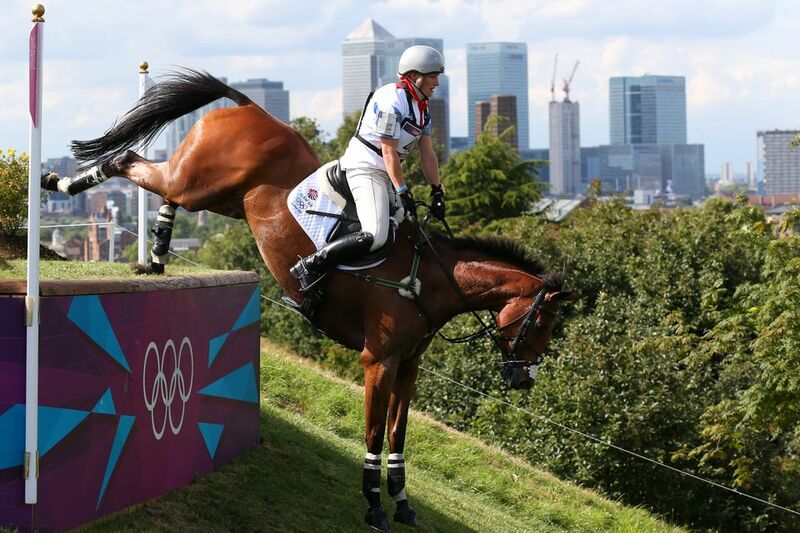 Read more about Olympic Equestrian Rules and Scoring. Olympic dressage is held in a flat 20 X 60-meter arena. The horses wear minimal tack usually black in color. At the Olympic level, bridles will be a curb bit with a bridoon (sometimes called a double bridle). A plain cavesson, flash, figure-eight or drop noseband may be used. Saddles will be dressage style with a straight flap and a white square saddle pad. No boots or wraps may be used. The riders wear a shadbelly tail coat, yellow vest, top hat, white gloves, white breeches and black tall boots. Horses will have their manes braided and may be banded with white tape. Tails may be braided but are usually left flowing to encourage natural tail carriage. Rules for tack and clothing and arena for dressage and jumping are similar to these individual sports. The cross country course consists of jumps made of very solid natural type obstacles. During the cross country phase, riders will be seen wearing jerseys and helmet covers in their team colors, an ASTM/SEI helmet, gloves and body protector. Riders wear eventing watches with a large readout that allows them to keep track of their time and alert them when 'optimum time' has been reached. Horse's tack will be similar to jumping, but boots are secured with tape and shoes may have studs for extra grip on tight corners. White colored 'leg grease' is also seen on some horse's front legs to help them slide over fences they may hit. Olympic show jumping courses will be colorful with many technical twists and turns. Course designers will include spread jumps, verticals, and combinations. The spaces between obstacles will be set up so that riders must control the length of each stride to set up properly for the next jump. Tack includes a forward seat saddle that allows support and security for riding over fences. At the Olympic level, white square saddle pads are used. There are few restrictions on the types of bridles, bits, and martingales. Some horses may wear hackamores and bitless bridles. Boots, wraps and other protective gear can be worn. Riders must wear ASTM/SEI approved helmets, buff, tan or white breeches, and will most likely be seen wearing a team jacket. Horses are well groomed. Tails may be braided and manes will be pulled and may be braided. Each country may have a maximum of 3 riders competing for individual medals in the dressage competition. There may be 4 riders from each country in jumping and 5 in eventing competing for individual medals. Showjumping placings are determined by the fewest knock-downs, penalties and fastest times if there is a jump-off. Dressage placings are determined by the highest scores with 100% being the ideal score. Eventing medals are determined by the combined scores for all phases. In all cases, the combined scores of all team members are calculated to find the winning team in each event.